Everyone wants their aquarium to stay clean, clear and odor-free! Having a good aquarium filter makes having a healthy, good-looking aquarium much easier! But there are many types of aquarium filters to choose from. One of the most powerful and versatile types of aquarium filtration is the canister filter. Canister filters are designed to provide powerful and complete filtration for freshwater and marine aquariums. The combination of specialized filtration media and a high flow capacity is unmatched by other filter categories. Is a canister filter right for your tank? We’ll tell you everything you need to know and review some of the most popular canister filters on the market. How Do Aquarium Canister Filters Work? The baseline purpose of a canister filter is to force aquarium water through multiple types of filtration materials. The idea is to remove various kinds of pollutants from the water stream as it flows through the canister. The canister is a sealed tank, packed with filtration media. Aquarium water flows from the aquarium and into the canister filter. A water pump mounted in the lid of the canister, pulls water through the filter media and pushes it back to the aquarium. The two main components of a canister filter are the canister and the lid. The water pump is sealed inside the lid. The lid is removable to load and service the filter. Clamps lock the lid onto the canister, forming a water-tight seal. Many canister filtration systems have a set of quick-disconnect shut-off valves. The valves make changing the filter media much easier by allowing you to carry the water-filled canister to the sink. Canister filters vary in the size of the canister, types of filter media they accommodate and the flow rate of the water pump. Canister filter manufacturers match their filter models to recommended aquarium sizes. There are three basic categories of water filtration. Many canister filters come with all three types. Mechanical filtration is the first stage of filtration inside the canister filter. Mechanical filter media physically screen out suspended debris from the water. Solid fish waste, plant fragments, pieces of uneaten fish food and other solids are removed by mechanical filtration. Pre-cut filter foam is one the more popular media options. Some canister filters even use two layers of foam pads, each with a different pore size. The large pore foam removes the larger particles first. The second foam pad, with smaller pores, remove smaller particles of organic matter and even suspended bacteria that cloud the water. Foam filters should be rinsed every few weeks. If not, they’ll clog with organic sludge and slow the water flow rate through the canister filter. Mechanical filter media is available in several formats. 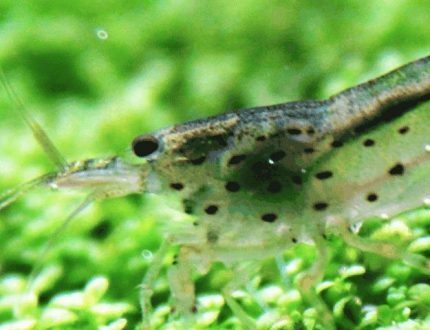 Chemical filtration media removes harmful pollutants dissolved in the aquarium water. Most dissolved chemicals, like ammonia, nitrite and nitrate, are colorless and odorless. Ammonia is a toxin released by fish, invertebrates and decaying fish food. Dissolved organic compounds (DOC) can build up in aquarium water. This creates a yellow tint to water, characteristic of dirty aquariums. There are a variety of specialized chemical filtration media that can be used in canister filters. Some media can be used in freshwater and saltwater, while filter media only work in freshwater aquariums. 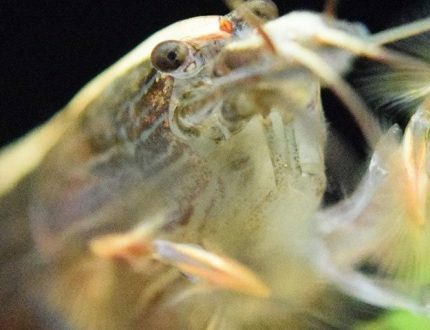 Ammonia removers only work in freshwater aquariums. The granular material removes ammonia released by fish and the decay of fish foods. Activated carbon adsorbs dissolved organic substances from freshwater and saltwater aquariums. These organics discolor the water, cause foul odors and increase chances of fish disease problems. Activated carbon works by adsorbing organics into the internal pores that form a network throughout the carbon particles. 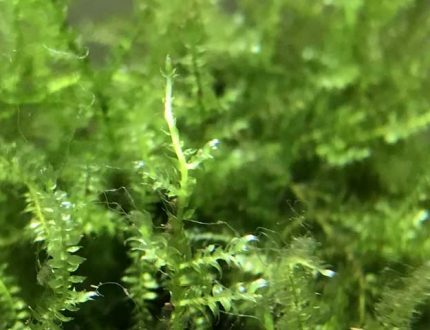 Phosphate removers strip algae-promoting phosphate from aquarium water. Phosphate is a nutrient that accumulates in freshwater and marine aquariums. Decomposing fish food and normal fish metabolism add phosphate to the water. Phosphate “feeds” the algae, helping it grow on the glass and coat the gravel and plants. Biological filtration is the process of converting toxic ammonia into nitrite, and then to relatively harmless nitrate. Biological filtration is performed by nitrifying bacteria. Nitrifying bacteria will attach to and form colonies on solid surfaces. Biological filtration media are designed to provide a place for these bacteria to live and purify the water. As water passes through the biological filter media, bacteria convert ammonia and nitrite to nitrate. You’ll notice that some canister filter models come with only one or two types of filtration media. Others will come with all three types of media. In most cases you can mix and match any type of filter media, even if it did not come with your canister filter. When the filter media needs to be changed you can use the replacement filter media designed to fit into your filter model. Mechanical filtration media can be rinsed and reused several times. Pre-cut foam pads are easy to change. Activated carbon is usually packaged in a flow-through pouch. You have the option to purchase specialty filter media in bulk and fill your own filter bags. Some canister filters use individual media baskets. The baskets are filled with media and stacked inside the canister filter. You’ll even find aquarium canister filters that have an ultraviolet (UV) sterilizer light inside. The UV light won’t sterilize the water but it will reduce the level of algae growing in the aquarium water. Canister filter flow rates are measured with no filter media in the canister and with least amount of resistance to flow. Under real-world conditions the actual flow rates will be less than stated on the package. You may want to consider upsizing to the next model. Look for canister filters that come with long hoses. This makes it easier to run the hoses behind the aquarium and reach the canister filter without kinking. 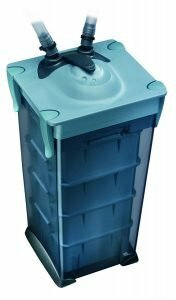 The best aquarium canister filters have sturdy clamps that hold the lid securely onto the canister tank. Flimsy clamps break easily and allow for water leaks. 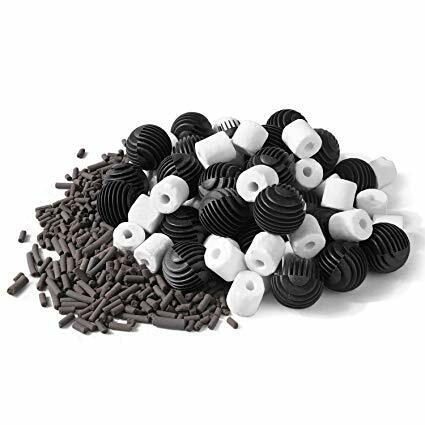 Look for a canister filter that has high-quality quick disconnect valves. The valves allow the canister to be disconnected from the hoses and taken to a sink for cleaning. The Marineland Magniflow is the latest model in the Marineland filter range. The canister uses four wide clamps to create even pressure on the lid. This feature, plus an improved gasket, make a fool-proof water-tight seal. A quick-release valve block shuts off the water flow and separates the hoses from the Magniflow filter. This makes it easy to carry the canister away from the tank for media changes. The priming button is used to start the siphon and fill the canister with water. The Marineland Magniflow canister uses three plastic media baskets designed to direct water flow through the filtration media. Better contact with the water increases the efficiency of the filtration process. The filter comes with a foam filter pad for mechanical filtration, activated carbon in a flow-through pouch and biological filtration media. The Magniflow uses a water polishing filter pad in the last stage, to remove the tiniest particles. The Magniflow canister filter is available in three sizes. 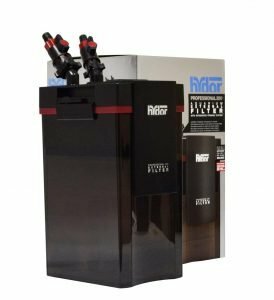 The Hydor Professional canister filter series uses a high-quality ceramic shaft on the pump motor. The impeller, which pumps the water, rotates on the ceramic shaft. A ceramic shaft ensures smooth, quiet operation of the water pump. The long hoses make it easy to connect the filter and avoid kinking. The canister comes with individual media baskets complete with mechanical filter pads and biological filtration media. The Hydor Professional series includes a spray bar attachment. The spray bar tube has a series of holes that spray water across the surface of the water. This provides aeration for the fish. The intake and spray bar tubing and fittings are mounted inside the aquarium with suction cups. One feature not found on all aquarium canister filters is a priming system. Without a priming system you’ll have to start the siphon into the canister by sucking on the end of the outlet hose. Simply pump the primer knob and water automatically fills the canister, pushing air out of the canister tank. This makes filter start-up quick and easy. The quick disconnect valves use ball-type mechanisms for smooth, leak-free action. The Hydor Professional canister filter line does not include activated carbon. The good news is that you can use any bagged, granular or pelleted activated carbon of your choice. There are five models of the Hydor Professional canister filter. The API Filstar range of canister filters are constructed of heavy-duty plastics. The canister and pump housing have a strong feel when working with the filter. Poor-quality filters have a lot of flex in the canister. This can eventually lead to warping and leaks between the lid and canister. The clamps that hold the lid to the canister are heavy-duty and won’t snap like weaker, smaller clamps used on budget filters. Filstar canister filters use a patented quick disconnect valve. A flip of the lever shuts off water flow and disconnects the hoses from the canister. The valve makes it easy to take the filter to the sink for maintenance. The six-foot long hoses are easy to attach to the inlet and outlet fittings. The heavy-duty media baskets nest inside the canister. 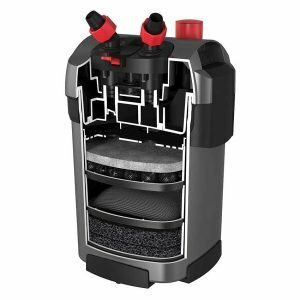 This one of the best canister filter comes with two types of pre-cut foam pads for mechanical filtration. The coarse foam pad captures large particles. The fine foam pad removes tiny particulates. Filstar filters also come with Bio-Chem Zorb for chemical filtration. Bio-Chem Zorb contains activated carbon and synthetic organic adsorption resins in a filter pouch. The filter includes Bio-Chem Stars biological filter media. Bio-Chem Stars are star-shaped structures with 50-micron pores, designed to house nitrifying bacteria. API makes several kinds of specialized replacement filtration media for the Filstar filters. There are four sizes of Filstar canister filters, rated by aquarium size. The Eheim Classic series is a member of the German company’s vast canister filter range. The Classic series of filters provide only basic features. But this may be enough for many aquarist’s needs. The Eheim Classic canister filters have the typical cylinder-shaped canister with a water pump mounted in the lid. The classic series don’t use media baskets. Filtration material is layered inside the canister, using flow-through bags of media. Eheim MECH, for example, are hollow ceramic rings designed to trap debris. This one of the best canister filter comes with Eheim SubstratPro, for nitrifying bacteria. The Eheim Classic filters don’t come with activated carbon. You can purchase pre-cut Eheim activated carbon filter discs or use activated carbon in a filter bag. The Polar Aurora canister filter combines traditional filtration with an ultraviolet sterilizer. Like other filters, this canister has a quick-disconnect valve system. The canister filter uses three media baskets, each with a handle for easy stacking. The baskets will hold pre-cut foam filter pads, bags of activated carbon and loose biological filtration media. The Polar Aurora canister filter includes fine and coarse filter pads, but no activated carbon or biological filter media. You have the option of using any brand or combination of filter media products inside the baskets. The fourth stage of filtration is UV sterilization. The filter has a 9-watt ultraviolet (UV) light built into the canister. UV light will kill algae cells in the water. This will keep the aquarium clear by inhibiting “green water” blooms. The Polar Aurora canister filter has a manual priming button. Pressing the priming button creates a suction that starts a siphon, filling the canister with water. The Polar Aurora filter comes with long hoses and a spray bar attachment. The Polar Aurora filter is rated for aquariums up to 75 gallons. 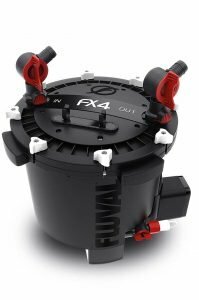 The Fluval FX4 canister filter departs from the typical canister filter design. The Fluval uses a digital pump motor with built-in flow sensing. The sensor automatically adjusts the pump speed for consistent water flow, even as the filter begins to clog. An automatic air purge system clears the canister of trapped air every 12 hours. This prevents accidental air locks that can cause water flow to stop. The FX4 uses round filter media baskets that nest on top of one another. The difference with the Fluval FX4 baskets, compared to other canister filters, is the way water flows through them. The Fluval media baskets have an outer and an inner chamber. The aquarium water flows through each chamber as it passes through the canister. This allows you to use two kinds of filter media in each basket. There is a total of five stages of filtration within the FX4 canister. The FX filter media includes pads for mechanical filtration. Bio-Foam pads are used to capture fine debris. Fluval Biomax biological filter rings are porous, ceramic rings for biological filtration. Pre-cut activated carbon filter pads are also available for the FX line of canister filters. The “Smart Pump” system automatically primes the FX4 filter and purges air trapped in the canister. The Fluval Aqua Stop valves disconnect the filter from the hoses for easy servicing of the canister. This filter system is rated for aquariums up to 250 gallons. The Fluval FX6 is a larger version, rated for tanks up to 400 gallons. 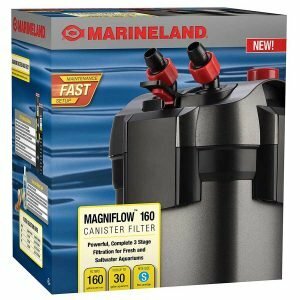 The Marineland Magniflow canister filters look impressive but have a reputation for motor failure. Future versions may resolve this issue. The Hydor Professional canister filters have a good reputation for reliability and performance. They’re easy to set up, run quietly and have a reputation for operating without leaks. With five models to choose from, matching one up to your aquarium is easy. API Filstar’s impressive build-quality means the canister will hold up over many years of service. The Filstar motors employ a high-end figure eight-shaped O-ring to ensure a leak-free seal. All API Filstar canister filters come “ready to run” with API filtration media. API also sells replacement parts and an assortment of filter media available in flow-through bags. The Filstar pump is very quiet and reliable. The Eheim Classic canister filters are reliable but can be considered “bare bones” as far as features and options. The Polar Aurora 4-stage canister filter with 9-watt UV is a relatively inexpensive canister filter. The addition of the UV sterilizer is not always necessary but may be a welcome feature for aquarists that struggle with green aquarium water. The Fluval FX canister filter has an excellent build-quality and uses “beefy” components that won’t snap or crack with normal use. 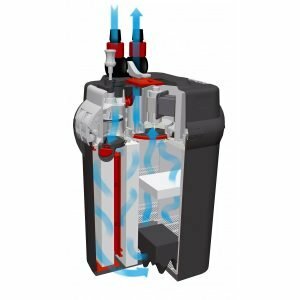 The “smart motor” ensures the pump is always moving the right amount of aquarium water. The automatic air purge is a great feature that keeps the filter running at all times. 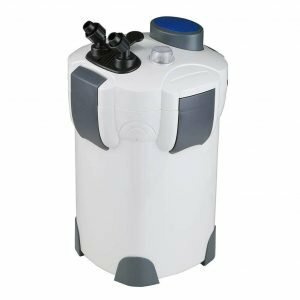 The Fluval FX canister filter range has the largest canister size, making it easy to pack the filter with any type of media. I’m using only canister filters. their are low maintenance and way more better when it comes to filtration than hang on filter or internal filters. I’m using Hydor Professional Canister Filter for past two and a half years and it works great. Looking for something different for my new 40 gallon fishtank. Maybe someone tried aurora filter mentioned here? Wow, really informative article! Found a lot of useful info here. Just ordered eheim filter, I think it will be perfect match for my new aquarium.